A study by an international team of researchers, published in Proceedings of the Royal Society of London B, looked at the parental care of over 1000 species of frogs and toads, and found those that reproduced on land invested more time and effort looking after their offspring. The authors suggest that because parental care increases the rate of survival of their young, it has played a key role in the colonisation of terrestrial habitats, not only for amphibians but also early tetrapods which ultimately gave rise to mammals including humans. The parenting behaviour of frogs and toads is very diverse, with care ranging from constructing a foam nest or attending the eggs, to more elaborate forms such as internal brooding of offspring or cooperation between parents to protect and provide food for their young. Some frogs that lay their eggs on land protect them from drying out by urinating on them. 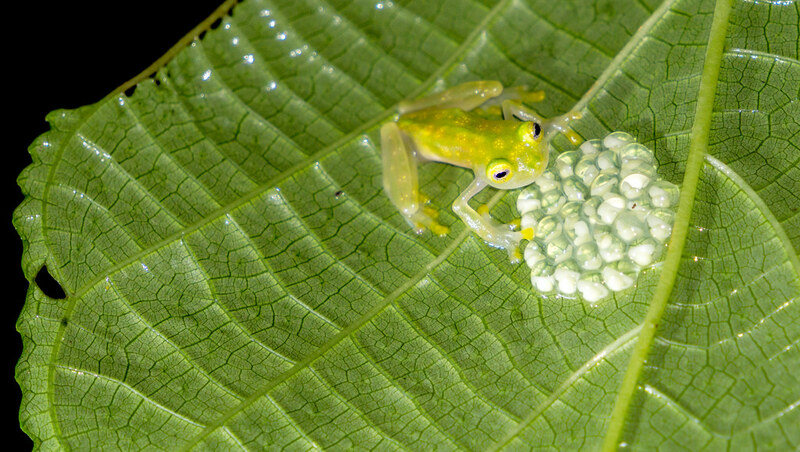 Others brood their eggs in their stomach or look after their eggs or hatched tadpoles by carrying them on their backs. Parental care may last for weeks whilst the parents defend, nurture and nourish their developing young. There are even frogs that that skip the tadpole stage to give birth their babies as fully developed froglets that are readily capable of independent life. Dr Balázs Vági, from University of Debrecen (Hungary), first author of the paper said: “Most people think about amphibians as an ancient group with simple social behaviours which need an aquatic habitat for its reproduction. “In fact, none of these are true in general. Most of the diversity of modern amphibians (8000 species, of which 7000 are frogs and toads) evolved after the cataclysm that wiped out the dinosaurs. “And they have striking adaptations to gain independence from water. Amphibian eggs and larvae are sensitive to drying out and are a favourable prey for many predators. But parents have invented different strategies to defend them, and to nourish offspring in nutrient-scarce habitats. Professor Tamás Székely, Royal Society Wolfson Merit Award holder from the Milner Centre for Evolution at the University of Bath, said: “Frogs and toads exhibit some of the most spectacular variation in parenting across all vertebrates, although the origin and maintenance of this variation have been a puzzle. “Using the most detailed phylogenetic analyses of parenting in any taxa, we discovered that parenting relates to their ecology and life history. “Thus complex social behaviour such as parenting seems to allow frogs and toads to invade apparently unsuitable habitats such as deserts. The study found that frogs that laid larger eggs tended to care for and protect their eggs for longer. They also found that in species where males were larger compared to females, the fathers were more attentive than those species where males are substantially smaller than their mate. The findings suggest that parenting by males and females has co-evolved and that complex parenting traits have evolved several times in frogs and toads in response to breeding in terrestrial environments. The researchers propose that tetrapods, four-legged animals, may have evolved complex parenting behaviour in a similar way when they moved from living in water to colonise the land. The study also highlights the need for more work on frogs and toads. Amphibians (frogs, toads and allies) are among the most endangered vertebrates. By pulling together a vast amount of data on reproductive modes, life styles and ecology, the study will assist conservation efforts by making these data publicly available.